Photo Cutline: Center, Ghazi Shahin, Vice President of Operations for the East Region for DCP Midstream presented the Coastal Bend College Foundation with a $50,000 donation as part of the Operation Next initiative. The funds will be used to provide scholarships for veterans interested in the oil and gas field. Local Beeville veterans Raul Meza, Rosendo Garcia, Rudy Garcia, Ray Rincon, John Salinas, Jesse Gonzales, Chano Cavasos, Jesse Garcia, and Armando Musquez were in attendance to show their support and gratitude of the Operation Next initiative at CBC. 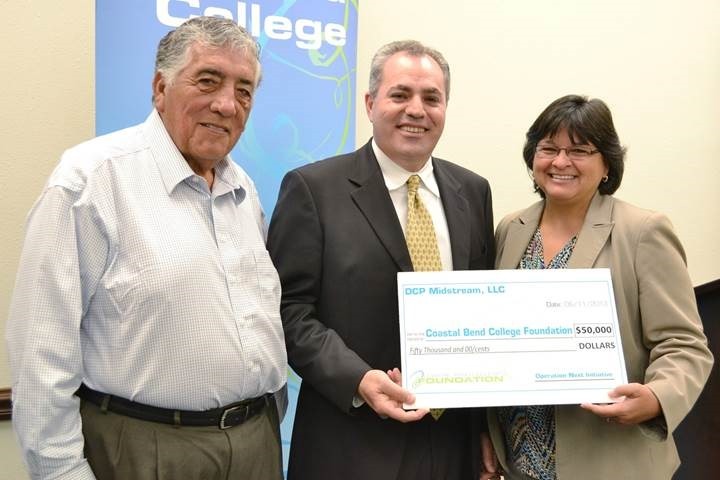 Photo Cutline: Coastal Bend College Board of Trustees Chairman Paul Jaure, left, and CBC President Dr. Beatriz T. Espinoza, right, accept a $50,000 donation from DCP Midstream’s Vice President of Operations for the East Region, Ghazi Shahin, center. CBC is the only college in Texas to receive these funds as part of the Operation Next initiative to help veterans obtain education in oil, gas, and petroleum related industries. 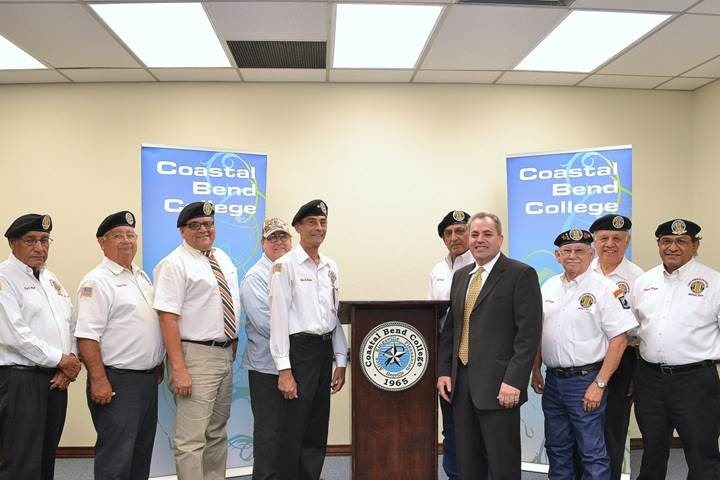 The Coastal Bend College Foundation received a $50,000 donation to fund scholarships for veterans enrolling in CBC programs related to the oil, gas, and petroleum industries. The funds were donated by DCP Midstream, LLC as part of their Operation Next initiative. “Operation Next is one way DCP can give back to veterans and the community. Veterans have discipline, structure, and technical skills. They have teamwork and leadership skills. But most importantly, veterans understand the importance of safety. This is why we recruit and help veterans. Safety is the most important thing in our line of work,” said Ghazi Shahin, DCP Midstream Vice President of Operations for the East Region. Current CBC oil and gas student Mike Fahey is an army veteran and expressed how opportunities like these help veterans reach their academic and career goals. Fahey is getting ready to graduate from the oil and gas technology program at CBC in August 2013, and he feels this donation from DCP Midstream may inspire veterans to enroll in college. “As an army vet, I was trying to think of what I could do for the rest of my life. Oil and gas was a good choice for me, and I have enjoyed my classes and instructor at CBC. Many young vets I know say they can’t afford college or have to work to save up to come to school. It leads to a ruthless cycle of working and putting school off, so these opportunities are huge for any veteran,” Fahey said. Veterans who are planning on enrolling in CBC courses/programs related to the oil, gas, and petroleum industries in fall 2013 can apply for an Operation Next scholarship from now until August 9 by contacting Rosie Streicher, CBC Veterans Affairs Specialist, at (361) 354-2421 or via email at rstreich@coastalbend.edu. Scholarships are available for college credit programs, continuing education courses, and CDL classes. The scholarship is open to veteran students at any CBC location (Beeville, Alice, Kingsville, and Pleasanton), and can be used in conjunction with other aid programs.